When War broke out I was evacuated with my mother to Basingstoke (Ugh!). We stayed there for about 9 months, which was enough, before we returned to London, where we lived for the rest of the War and the bombing. During my time in Basingstoke I won a scholarship to a grammar school. On returning to London, however, I found that all of the grammar schools had been evacuated far away from the capital, and the only sort of grammar-type of school that was operating was a secondary school in East London called Parmiters Secondary. one in the north, one in the south, one in the west, and Parmiters in the east. Well, Parmiters it was! When I went with my father to the school to meet the headmaster, one of the boys asked me whether I played football and like an idiot I said yes. So my father togs me out in the full kit including shin guards, boots, etc. BUT, he forgot to tell me how to play the bloody game or what I was supposed to do. Every week on a Thursday afternoon we would have to take a bus straight after lessons to somewhere in the back of beyond. It would take an hour to get there, so we would eat our lunchtime sandwiches on the bus. Then we would have to freeze our balls off playing football, or no frozen balls if it was summer and we were playing cricket. The football team soon sussed out that I was useless because, truthfully, I hadn’t a clue. So I, with quite a few other idiots, were told that if we weren’t in the football or cricket team we would have to do gardening – planting and digging up potatoes, etc. in the freezing cold – for the canteen in the school. It was definitely not for me! With a little cajoling, my mother gave me a note which said that I had to attend the Dental Hospital for my teeth (which were beautiful) every Thursday afternoon until further notice. I was off the leash! No more football, cricket or gardening! I breathed a great sigh of relief. 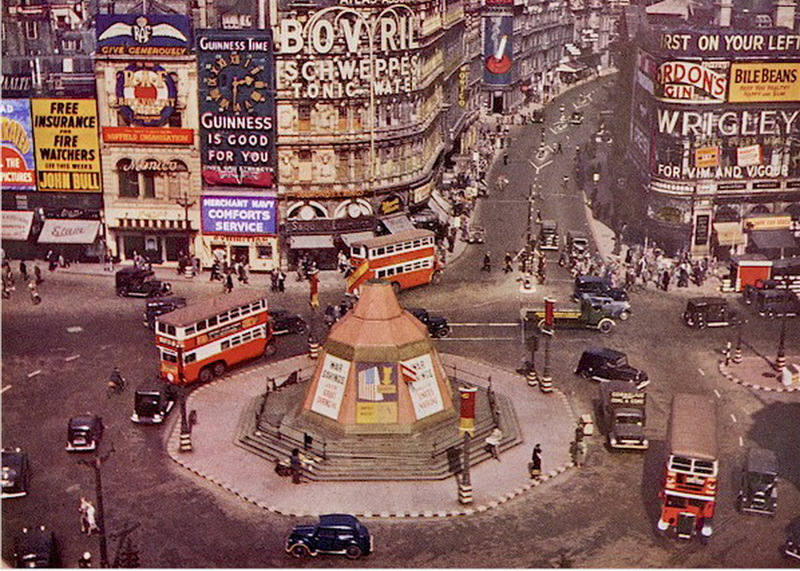 So every Thursday afternoon I would catch a No.8 bus from Bethnal Green that would take me to Tottenham Court Road and I had the West End at my feet and I loved it. I used to get a child’s fare, which was pennies, and I would spend my time exploring all of the West End and, when I wanted to, going to see every Thursday theatre matinee that was on. 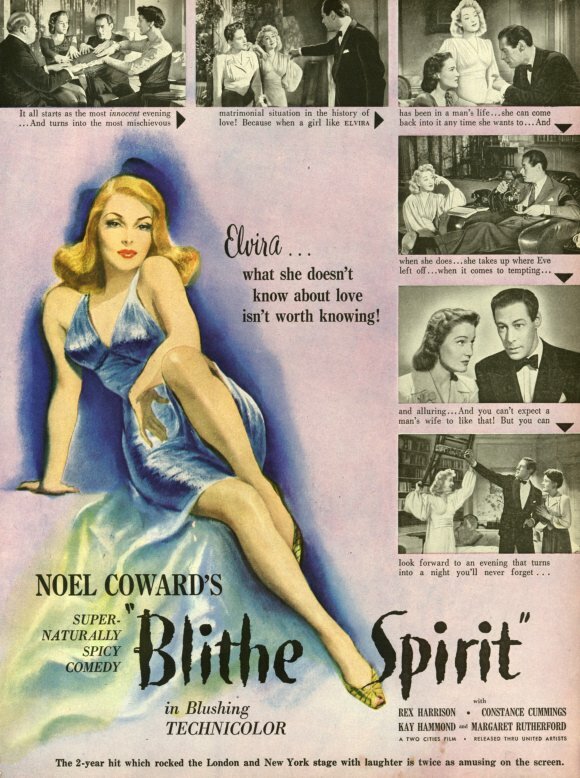 That was how I came to see the original “Blithe Spirit” at the Duchess Theatre in 1941. 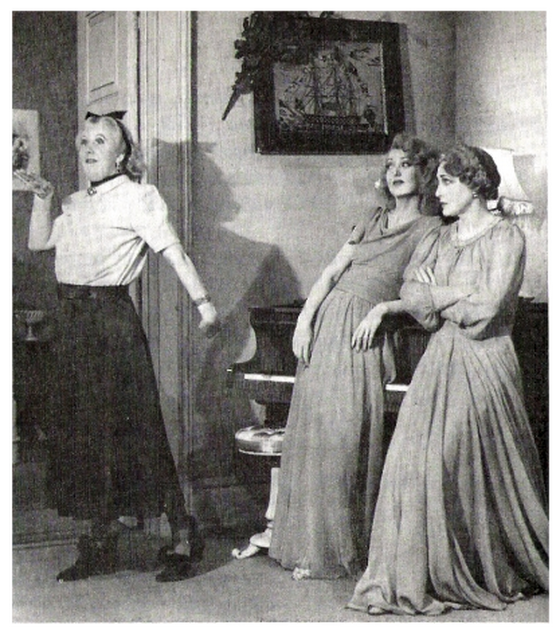 I saw the original artistes, Margaret Rutherford, Kay Hammond and Fay Compton, and I was enthralled by it all. In all the turbulence of what was going on with the War and the bombing, this frothy, light, amusing comedy was a tonic for everyone who saw it. I didn’t just see it once, I saw it 4 timesover a period of about 3 years, and always with a different cast. The play just ran and ran. The Germans at that time were raining bombs on London, but somehow we just seemed to get used to it. Life went on. It was the shrapnel from our anti– aircraft guns that was the most dangerous. You just had to be so careful of that. By the side of the proscenium arch in the theatres there would always be a box with a red light that would light up if there was an air raid warning and the audience could either leave and go to an air raid shelter or stay and watch the play, which would continue without interruption. Nobody ever left, unless it was a dire emergency directly overhead. When the All Clear sounded a green light would come on. When I went to see Blithe Spirit, I would sit in the dress circle. If I could run to it, I would sit in my seat and during one of the two intervals and have a pot of tea and a sandwich, which would be served by one of the usherettes. I have no idea how much the tickets were or what the tea cost, but they had to have been cheap otherwise I couldn’t have afford to go there because the most I had at one time was about 5 shillings. Blithe Spirit has stayed with me all these years, and now I am happy to say that I am going to see the wonderful Angela Lansbury at the Gielgud Theatre in London on the 2nd of June, which will be her last week, and I think a fitting conclusion to the wonderful memories that I have of Blithe Spirit. N.B. I had the pleasure of seeing Angela Lansbury on Broadway in Mame, and she was sensational. A year later, I went to her last night in the Musical and it was a though I had seen her performance 2 nights running. That’s how consummate a performer she is. She is perfection! 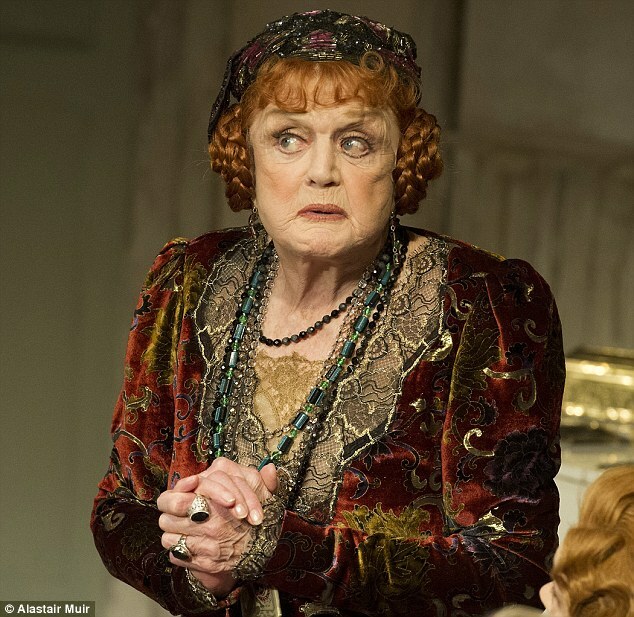 Well I finally got to see Angela Lansbury in “Blithe Spirit”, I am in no way knocking the fabulous Angel Lansbury because I adore her, but I was a little disappointed. It is over 50yrs, since I saw the original ‘Blithe Spirit’ so one’s mind in time is apt to glamorise the original concept of Margaret Rutherford in the role of Madame Arcarti. Maybe it was because Rutherford was heavier in the role. I just don’t mean weight wise, I just don’t know. But all in all, the show was good and I’m sure that Shane Collins who was with me enjoyed it. The great ‘piece de resistance’ was Angela Lansbury’s dance going into her trance which was worth the price of the ticket alone, and I am absolutely thrilled that I was lucky enough to see the famed Angela Lansbury once again.